Steed and Emma wheel away on stolen bicycles. An ordinary department store receipt found on a dead agent is a clue in the case of a missing scientist. 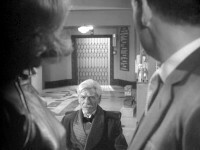 With Emma posing as a store clerk and Steed as an efficiency expert, they uncover an extraordinary plot to erase London from the map with an atom bomb hidden in the store. This episode is a winner in all departments, especially that of diabolical mastermind. The fight sequence gets off to a classically goofy start in the toy department with a pop gun, mutates briefly into a cricket match played with knives, and concludes with the premiere of Emma's trademark ballet-like "feinting." The race to stop the elevator from tripping the bomb is a real nail-biter. 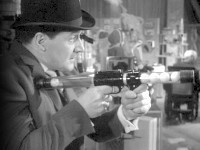 And Steed has one of the very best lines of all time. Outstanding direction courtesy of none other than Charles Crichton. 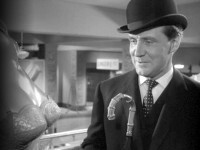 This episode is a favorite of Patrick Macnee's.